Rhubarb Crunch combines sugar with the lip-puckering plant to turn it into a sweet dessert. Prime rhubarb season runs from April through June. Cost: $8 per day or $15 for a two-day pass. Cash only. Rhubarb is no wallflower. It almost never stands alone. Too sour to eat by themselves, rhubarb’s raw, pink-red stalks require cooking and accompaniment. Even then, the lip-puckering “pie plant” is usually paired with berries – not to mention sugar – to sweeten it up. Tasty but tart, rhubarb just needs a little something to temper its famous zing and offset its acidity. There’s still plenty of time to enjoy it; prime rhubarb season runs from April through June. And there’s a lot to do with it once it’s sweetened and cooked. Rhubarb can be used to flavor yogurt, ice cream, jams and shrubs, or baked into cakes, tarts and, of course, pies – just to list a few ideas. In Green Bluff, Serena Thompson carries on her mother-in-law’s tradition and turns it into rhubarb crunch. The dessert features “a crispy, sugary crust and thick, sugar-syrup drizzle” which creates “a chewy goodness to top it all off,” said Thompson, 44, a contributing editor at Country Living magazine. She’s also the author of two books – “The Farm Chicks in the Kitchen” and “The Farm Chicks Christmas” – and creator and organizer of the Farm Chicks Show, an antiques and crafts fair that takes place this weekend. Thompson’s first memories of rhubarb date to her childhood, when she lived on the road and, later, in a rural outpost in Northern California. She spent her earliest years as a nomad with her parents and two older siblings in what she calls a “hippie gypsy wagon,” hand-built by her father on the back of a 1937 Chevy flatbed truck. Eventually, the De La Luz clan settled in a cabin in the woods – with no running water, refrigeration or electricity – along the Klamath River and Thompson used their former rolling home, featured in Lloyd Kahn’s 1973 book, “Shelter,” as her bedroom. Her mother-in-law’s beloved rhubarb crunch takes the dessert to another level. Thompson has been making it since she married into the family. It’s included in a family cookbook her mother-in-law made for her children as they began moving away from home. The perennial is low in calories and high in fiber, calcium, potassium and vitamin C.
Its earliest known uses date to ancient China, where it was cultivated for medicinal purposes. Rhubarb is said to aid digestion. However you use it, be sure to discard the leaves; they are toxic. These days, Thompson lives in a custom farmhouse on 10 acres north of Spokane. She shares her story and snippets of her daily life on her website, where she blogs and offers recipes, photos and ideas for arts and crafts. Much like the farmers who once worked the land, she said, rhubarb “is resilient and loyal, and asks nothing in return. 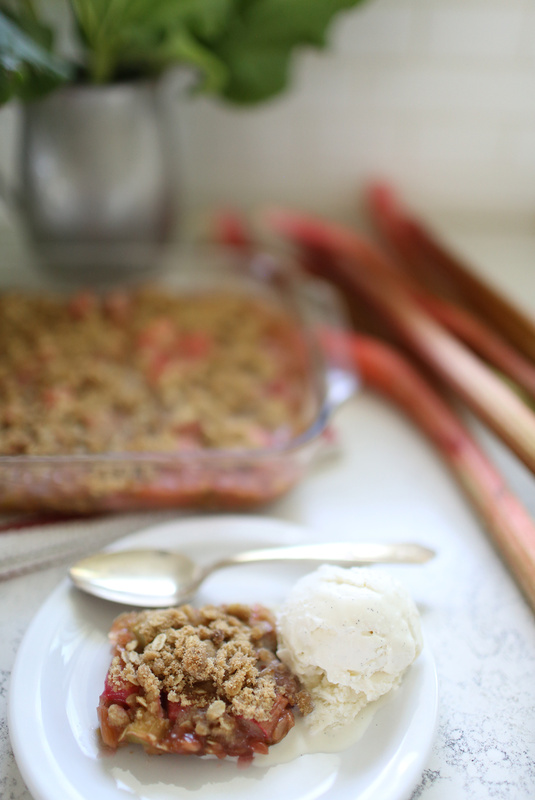 Chop rhubarb and set aside. Mix together the flour, oats, cinnamon, brown sugar and melted butter. Press half of crumb mixture into a buttered 7-by-11 or 8 ½ -by-11 baking dish. Whisk sugar, cornstarch and water together in a glass bowl. (Whisking is important to completely dissolve the cornstarch. If you leave any lumps, they’ll appear in the sauce). Microwave sugar mixture until thick, clear, and bubbly, 3 to 5 minutes. Remove from microwave and whisk in vanilla. Add chopped rhubarb atop pressed-in crumb mixture in the baking dish. Pour sugar sauce evenly over rhubarb. Top with remaining crumb mixture. Bake at 350 degrees until edges are bubbling and crumb topping is browned, about 30 to 40 minutes. Serve warm with vanilla ice cream. • Rhubarb plants can be split and shared. In the fall, dig down to get a shovelful of the root. Dig a hole in a nice sunny spot and plant. Give it a little water to get it started. When the plant comes up the next spring, resist the urge to cut its stalks. It needs this first year to get established. If you do this, it will produce for you forever. • When picking stalks, look for the ones with the most color. When a stalk is ready, you can tug on it and it will pull clean away from the plant. No cutting required. • Rhubarb can continue producing through the fall. Verne Fallstrom at Strawberry Hill Nutrition Farm in Green Bluff periodically mows his plants down throughout the season to get high production.